The messages in this poem apply in so many areas of our lives. Often we may be seeing the trunk while others are looking at the tail. John Godfrey Saxe's (1816-1887) version of the famous Indian legend. What are your ‘blind spots’? What is stopping you from seeing the Big Picture? A good coach can help you to broaden your horizons. For more information on Executive Coaching services please contact brenda@strategy-leadership.com or phone +27 82 4993311. Conference or event evaluation on a professional basis is a service I offer. Having a qualified outsider’s view provides constructive ideas on how organisers can continuously improve on each event. The question is: ‘How can we increase the value from the organisation and participants’ point of view? And it is important for them to remember to continue doing what is working well and stop certain aspects to create space for what needs to be started. Recently, over a ten day period, as a presenter or guest, I was privileged to have been involved in four different conferences, seminars or major events staged by organisations, firms or businesses. These varied enormously and were independent of each other: I have chosen this combination of diverse organisations and functions in order to provide real-life examples for the points that follow below. A public event or event planned for a selection of clients should be an extension of what your firm stands for. You can always test the validity against your vision and values. And is the event in line with your corporate branding? The hosts are able to be ‘real’ when leaders and staff appear and behave in line with the corporate image. They are acting out ‘this is the way we do things around here’. A huge amount of unnecessary energy goes into providing a veneer, something on the surface that does not reflect the real soul or culture of the organisation. And the participants may feel confused by the different ‘messages’ they are experiencing. I’m not saying that you shouldn’t try something new. We have to do that in order to grow. And if mistakes are made, we need to learn from them. We also need to apply our immediate ‘bounce back’ strategy. And this includes communicating immediately with all relevant role players when expected standards are not reached. A good example of ‘authenticity’ was the ‘Emperors Palace Summer Ready to Run Sale’ day at the Summerhill Stud. Can you picture the scene? We were in the beautiful thatched conference centre enjoying food from the award winning Hartford team and looking out over the most magnificent view. And yet Mick Goss and his team found a way of bringing the horses into the same room, with their grooms, one by one in order to be auctioned. The event also incorporated advanced technology. We remained seated at the round tables where we had enjoyed lunch and this unusual combination of events worked. Why? It was authentic. 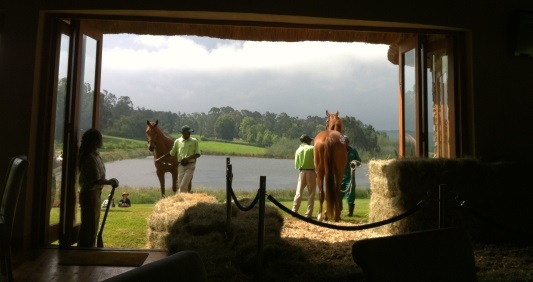 Summerhill Stud Convention Centre – the view from our lunch table. There needs to be a cohesive welcoming attitude coming from the people at the top to those lower down in the organising and hosting chain. Guests need to feel that the whole team is really happy to have them there. And I must say that all four events mentioned above scored exceptionally high on that point. A watchpoint should always be that enough preparation has gone into the event so that the organisers can relax and enjoy the event with their guests. The team who are collecting papers or dealing with emergencies can work unobtrusively in the background. Being pro-active in anticipating what guests may need also makes guests feel really good. There needs to be ‘action’, too. For example, at the TAFI (Travel Agents Federation of India) event at the ICC (International Convention Centre) in Durban, even the dignitaries always watched and stepped forward to help my husband who has had a stroke and is handicapped. And as a presenter I was overwhelmed by the expression of sincere gratitude after my ‘keynote’. It was important in both these examples that ‘head, heart and action’ were combined. 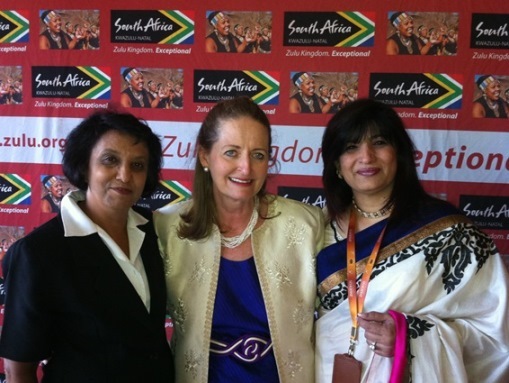 Bunny Bhoola, South African organiser, Brenda Eckstein, presenter and Aditi Bhende, TAFI Convention Chair from India. Each event listed above had excellent hosting. In all cases it was a great team effort where the leader was actively involved and the team members followed through in an appropriate manner. I liked the way that at the TAFI convention, where some of us were staying ‘on site’ at the Hilton next to the Convention Centre, two of the SATSA team (Southern Africa Tourism Services Association) were on duty in the hotel lobby assisting participants from early morning till late at night. For any queries, whether they referred to the convention, accommodation, transport or the tours they handled them for us with an attitude of helpfulness. Nothing was too much trouble and I commend them highly. At the Morar Incorporated event, during the talks, two staff were allocated to vigilantly watch the audience from the side of the room and they did. If people needed more water or had any other requests, the staff noticed and immediately followed through, liaising with hotel staff or whoever else needed to assist. We can’t always have the benefit of food of this quality. However, there are many watchpoints even when mediocre food is being served. For example, although I do eat meat occasionally, I usually prefer ‘vegetarian’. Where there is a buffet, vegetarian is usually marked. One event this week had very little for those who don’t eat chicken or meat – and it wasn’t marked. When planning with the venues, organisers should check how buffets are going to be laid out. At one event, queues would have moved much faster if people had been helping themselves on both sides of the table. But the table was placed almost against the wall. The table could easily have been moved a short distance away from the wall and people could have worked on both sides of the table. I must say that the TAFI gala dinner at the ICC was an amazing event. To have 1000 people seated at round tables (100 tables) and served expediently requires great skills. And this was executed by cheerful servers with precision and minimum fuss. It is wonderful when you see the corporate branding consistently showing throughout the event. There should be consistency from the invitation, during all aspects of the event to the ‘thank you’ sent after the event. Personal branding is very important, too. I commend Mick Goss of Summerhill on the way that he and all the staff are dressed in a way that is congruent with breeding horses. It added a feeling of ‘trust’ to all that happened that day. Graemor and Morar Incorporated were also excellent in the way that the outfits worn by the staff were in keeping with the branding of their events. If you are providing bags, please make sure that you provide all delegates with a bag. And this includes the presenters. We need programmes and we need to have the information that the delegates have. It always wonderful when participants are given ‘just what we need’. With theatre-style seating it isn’t possible to give each person a pad, pen, water and sweets, laid out – there are no tables in front of participants. Graemor handled this magnificently, giving each person a brown paper bag containing relevant and useful items. And I must commend them on the notepads they gave out. These were beautifully branded with the programme printed on the inside cover of the branded notepad. It was so easy to find and refer back to. Summerhill also handled this well as each person took a folder as they arrived and all the items they needed for the day were in the folder. Morar Incorporated had their branding running through. Even the ‘question cards’ for the speaker were branded. It was excellent that anyone could write down their questions on the cards and these were collected at the appropriate time during the session and handed to the speaker. It was very well organised. Both Summerhill and Graemor scored a huge ‘plus’ for this aspect. If there are boundaries, the guests know what to expect and this makes it easier for everyone to stick to the structure. However, in the case of Morar Incorporated, there was a very good reason to go overtime and it was worth every minute of listening to that spontaneous ‘impromptu’ speech by a dignitary. And it was the last event so it didn’t impact on speakers following. By going overtime into the breaks, often participants need to disrupt the event to get to an appointment or are late. And people become very frustrated. So there is a ripple effect. Events need to start exactly on time and end exactly on time. And there can never be the excuse that ‘oh we didn’t have enough time’. Professionals fit what they have to do into the time available. And they are flexible so that they can adapt when the need arises. I believe that we need to honour those who are present on time, and start. At least call the event to order and ask for an immediate 5 minute recess (an example – you may ask for a different time period) if necessary. And then reconvene exactly five minutes later – at the time that you said you’d resume. But respect those who are there on time and thank them. By the Programme Director being ‘in control’ an orderly event can be expected and is more likely to satisfy the majority of participants. The organisation’s goals will be met and so will the participants’ goals be met. In the planning stages, manage time and manage energy. Time is not renewable whereas energy is. It is important to plan enough time for people to comfortably network in appropriate breaks. There is a narrow balance between people feeling that time is being wasted and that it is being used constructively. Allow comfort breaks and tea breaks carefully and if people aren’t back on time, just start without them. Delaying for the few who are late isn’t fair on others and they soon learn that the Programme Director is in control. People need to know that the event is being managed. Professionalism is an important part of all that we do. Whether people are paying to attend your event or participate in some other way, deliver what you promise – or ‘overfly their expectations’. Don’t offer them a ‘fun morning’ and then bore them with long speeches that are not relevant. Don’t use this event as a platform for other issues. Of course, you are entitled to promote your business, or products or get the sales. But people must know what they are coming to and be satisfied that they have had value for money and value for the time invested. So, in planning we have to be absolutely sure of what we are offering, make sure we are communicating this effectively and follow through on delivery. When things go wrong and those involved are not satisfied, we need to have a sound ‘bounce back’ policy in place. What can we do to more than ‘make amends’? The way we handle this can ‘make or break’ our relationships. The sooner we respond, showing that we acknowledge their concerns, the more professional and effective the outcome is likely to be. Remember that people want us to validate them: ‘I see you, I hear you and what you say matters.’ If we leave serious issues to smolder, more emotion is added and the outcomes can be disastrous. And this is another reason for ensuring that all communication comes from a unified base. Does every member of your team understand exactly what is being offered? And does he/she understand the impact of not following through according to participant’s perceptions? Is every component relevant to the whole? This is one of the questions that we need to ask when we are in the planning phase. And will it help to add balance to the whole programme or sequence of events? Will energy levels be maintained? Is another question we need to ask. For example, after a serious speech we may need something light. At the TAFI convention I was delighted when the organiser asked me to keep my keynote ‘light’. I knew what was expected. I needed to provide a powerful message in a way that the audience enjoyed. Knowing this I was able to plan accordingly and it worked. The follow up was excellent. At Summerhill I am always very impressed by Mick Goss who is the master of creating events that achieve his purpose in the nicest possible way. He and his team are continually trying new things and improving. This time he held the viewing, followed by the video footage of each horse. During the auction as each horse was brought into the room to be auctioned, the video specific to that horse was again played in the background. There were also staff members available to show the videos at any time that prospective buyers wanted to view them. I have mentioned just a few of the many areas that need to be considered when evaluating a conference or other event. Get greater value from your events by having them evaluated by an expert. You and your clients or members will benefit. You’ll be able to continuously improve. Gary Eckstein, WordPress and SEO (Search Engine Optimisation) specialist designed and manages the BEI (Brenda Eckstein International) website and can help you with yours, too. He is the guy who helped me to turn a ‘stumbling block’ into a ‘stepping stone’. My new website is a source of pride and enjoyment. Thanks, Gary! Gary is a trainer and technology consultant based in Sydney, Australia. Contact Gary at gary@eckstein.id.au for assistance in selecting and implementing Learning Management Systems. Content is king! There is no way around this and all the off-page or black-hat SEO you may employ will be in vain unless you have content that people want to view/read. Search Engines understand text better than video, images or sound so if you don’t have much text then make absolutely sure that you always fill in the meta fields such as ‘Title’, ‘Alt’ and ‘Caption’. Search Engines take notice of the text in these additional meta fields so use them to properly described what is in your image, video or sound file. Action: In 2011 make an extra effort to include relevant content that your viewers want to see, hear or read. In addition help the Search Engines by including extra data where relevant. As inferred earlier, helping the Search Engines to crawl your Site is good SEO! There are numerous free (and paid) services available that will help you identify where Search Engines are having difficulty crawling your Site, where links may be broken and so on. Two of the best services are Google Webmaster Central and Bing Webmaster Tools and with these two being free to use there is no excuse to not take advantage of the brilliant SEO positive information that they provide. Action: Sign up and enable one of these Webmaster services and then every few weeks sign-in to see what the services are seeing and where they are having problems. Make changes to your Site accordingly and you will benefit through higher rankings in the SERPs. Localization has become a very hot topic of SEO in 2010. It is still early days for localization and even the definition of this term differs (e.g. does localization refer to a neighbourhood, a state, a country etc.). One thing is for sure and that is that there are some activities related to geographic location that make for good SEO and in 2011 the importance of localization will continue. Things like hosting your Site in the same country as your target audience and having a TLD consistent with your target audience all make a big difference to the quality and quantity of visits. Action: Get a domain name with the Top Level Domain (TLD) of your target audience (e.g. for Australia get a .au domain name). Also, host your Website in the country of your target market. Regular readers of my content will know that I am a big fan of setting Website objectives and then focusing Website activities on meeting these objectives. I’m amazed that setting Website Objectives isn’t often mentioned as a critical SEO activities but I guess that’s because it is very strategic rather than tactical. Setting objectives is kind of like looking at a map; if you don’t know where you are going then how do you know which route to take. Objectives define where you want to go with your Website and then all the activities you take regarding your Website is essentially the route to meeting your final destination (your objective/objectives). Action: As soon as you can set your Website objectives and then throughout this year focus on meeting those objectives (just remember to describe your objectives in high-level business terms; an objective like ‘have a minimum of 1000 unique visits a day by 20 December 2011′ isn’t generally a good a objective as what business outcome are you getting by having 1000 unique visitors a day?). I am very biased towards WordPress Websites because of my being a WordPress Website Designer. Because I often move clients from their existing Web software to WordPress I get to see first-hand the SEO benefits of WordPress. I honestly believe that WordPress is best for SEO for two reasons; WordPress is naturally SEO ‘friendly’ and equally importantly, WordPress makes it so incredibly simple for people to SEO their content (e.g. with meta data, ‘prettylinks’ etc.). Action: Move to WordPress, you won’t regret it! Learning and development (L&D) makes business sense for most organizations. The significant advantages include increased employee motivation and improved employee skills and capabilities in addition to satisfying the various legal and stakeholder requirements to develop staff. Keeping records in relation to L&D is necessary (in Australia electronic records often need to be kept for 30 years) as is making L&D accessible and relevant for employees. A significant portion of L&D involves training and this is the focus of this article. The needs of learners have changed markedly over the past decade. With the proliferation of technology in business as well as in everyday life, learning is increasingly becoming decentralised and varied in content and method. Whereas ‘classroom’ teaching alone may have satisfied most learners a few years ago, combinations of media and extension of geographic reach are becoming necessary (increasingly video, wikis, blogs and the like are being combined to form successful training materials). The solution to the changing training landscape has been in the form of software suites called Learning Management Systems (LMS). These software systems combine course content (for online education for example), assignments and records of attendance and attainment making them a single solution for managing most aspects of training in organizations, both educational and in other industries. The uptake of LMS has been rapid, particularly with the widespread use of Internet connectivity. The first widespread ‘wave’ of LMS use began in the late 1990s with the adoption of learning software systems in large corporate enterprises, government departments and larger educational institutions such as universities. We are however on the cusp of a new wave of LMS implementations. Due to the improving capabilities along with increased support and reliability of General Public License (GPL i.e. free to implement and use) Learning Management Systems, the Return on Investment (ROI) of implementing and maintaining a LMS is proving attractive to medium and even some small size organizations. Whereas in the past LMS cost a fortune to license, implement and maintain, the costs have become affordable to smaller organizations particularly when weighed against the benefits that may be attained. This is resulting in a new wave in rapid uptake and implementation of Learning Management Systems. The major proprietary Learning Management System developers and vendors had a very valid argument for persuading potential customers to ignore GPL systems; GPL systems lacked support, were short on features and were unreliable. Unfortunately for the major proprietary LMS vendors, the tables have turned; GPL systems are now often more reliable, have more features, have a far broader support based (such as documentation and online forums) and are simpler to implement than the propriety systems. If your organization is thinking of implementing or updating a LMS it is thoroughly advisable to consider some of the GPL alternatives such as Moodle, Ilias and Claroline. Nowadays a strong case needs to be made to implement a non-GPL LMS. Brenda Eckstein International is pleased to begin this new series of weekly blogs with an article by associate, Gary Eckstein, business consultant based in Sydney, Australia. Blogging started as a means for anyone to be able to communicate information on the Internet; it was less expensive (often free) than maintaining a website and far more personal. Blogging has evolved significantly since the early days and the divide between websites and blogs has become increasingly blurred. The fundamental difference between a blog and a website (in the traditional sense) is that a blog contains frequently added content in the form of ‘posts’ (sometimes called ‘articles’). Many organisations use blogs for public relations purposes. Blogs are an ideal means of putting across a message to interested readers. The content of a blog is managed by the blog owner meaning control of the ‘message’ (content) being communicated. Because most blogs also allow feedback from readers it is a great way of engaging potential from existing customers as well as attaining feedback from them. Once your blog is established it also provides the opportunity for a more direct style of marketing. Quality blogs, over time, attain regular readers which results in a willing sales channel! Google, Bing and other search engines love blogs because of the frequently added content and engagement with readers. Blogs also often attain more referrals from search engines than traditional websites. Of course the advantage of visitors being referred from the likes of Google is an expanding audience of potential customers. Increasingly quality websites include blogs as part of the business website itself due to blog benefits (this website is a good example of a combined website and blog). It is essential for business blogs to align the ‘look and feel’ and content of the blog posts to business strategy. As an example there is little point in publishing a post about the advancement in quality of low cost suits when you sell premium ‘made to order’ suits. Blog posts must support the objectives and strategy of the business. Of additional importance is recognising that a blog is an ideal means of positioning your products or services and brand in the mind of the consumer. It is a critical mistake to confuse your consumer in terms of your positioning (again the suit example used previously is applicable; if you sell premium suits then don’t confuse your customer by communicating the benefits of low cost suits). Finally in relation to strategy, a blog must be considered a deliberate and long-term activity. As branding is a sustained and deliberate set of activities, so is a blog; benefits won’t be realised overnight however the long-term advantages may be significant. So, where does a business start in relation to blogging? Unfortunately there is usually a divide between ‘I.T. people’ and ‘business people’ (i.e. although I.T. people are good at I.T. they often lack business and strategy understanding). It is therefore important to find and employ the services of a consultant who is able to cross the I.T./business divide. This consultant should then be tasked with planning for, and implementing a blog which will work towards the aims of your particular business. Blogging is typically far less costly and more effective than other forms of P.R. (and marketing) however does require new posting of content occasionally e.g. once per week.